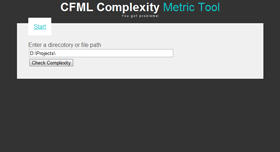 A little bit ago I committed my first code to GitHub in the form of a project I’ve been tinkering with, a cyclomatic complexity measuring tool for your CFML apps. It’s just a few files and a snazzy interface that will give you a heatmap kind of display to help highlight areas of complexity in your ColdFusion apps. It’s a quick toy to play with, and maybe it can help you reduce or refactor some of the more complex aspects of your applications, so give it a try! Finally, big props to Sean Coyne for already dropping a patch on it. I like this Github stuff, but I don’t understand all the terminology yet. Back a few years ago, before bind parameters were the cool thing to do with your queries (even if they should have been), it was easier to debug your queries in ColdFusion because you could scroll down to the debugging information, copy your SQL statement and paste it into your database tool of choice to run ad-hoc style. Parameter #2(cf_sql_varchar) = 1234 Main St.
How useless is that? You can't copy and paste that into your database query tool. Short of changing your debug template, you're stuck moving those values into the query one at a time to run it again in a controlled environment. So I made a tool to simplify this. It's a simple .NET desktop application. You paste your debugging output query (like that shown above) and it will fix all the fields and give you something to paste back into your SQL editor, ready to run. It's a simple concept, and maybe I'm the only one who will ever use it, which is fine, but let me know if you like it, if you can use it, and what improvements we can make. Download the CFQuery Reassembler now (requires .NET runtime 2.0). I would call this the 1.0 preview version. If you get any queries that don't come out right, drop a message here or mail me. If you have any useful suggestions, I'm all ears, but please remember I'm not a c# winforms guy, so don't expect any real magic. PS - I'm releasing this as a BSD-licensed application. You can download the CFQuery Reassembler source code and VS2005 project files, here. Last weekend I updated my family photos area. I have to do something to it every few months so my wife will keep using it. In the process, I created a cfc for paging through a query. I saw something similar on cflib.org, but I was hoping for something a little more OO and a little more customizable for me to use on any number of other projects. Some cool things about it is the customizable output and the caching when you call getRenderedHTML() so you can output it at the top and the bottom of the page without any performance hit. Some room for improvement would be adding a few more convenience methods like getCurrentPageNumber() and the option to leave the <Previous link text up (but no link) when there is no previous page, that kind of thing. More suggestions are definitely welcome. 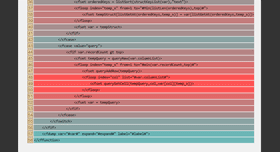 Also I think the API will change somewhat to make it more discoverable, but I'm not sure how, yet. I created it and licensed it this weekend without a release, then earlier this week, I realized I could use it in a project at work. I downloaded it and dropped it in, and it worked perfectly with nothing to change. So, this is version 0.1 with a BSD license (free to do what you want with it but leave my © on it). Download Pagination.cfc here. BTW, before there is any confusion, this is a one-use-only object, you create an instance of it when you need to output pagination and throw it away with the page. Do not put it in your application scope. Coldspring users, singleton=false.